On Easter Sunday, March 27th, Mother Angelica passed from this world to the next. 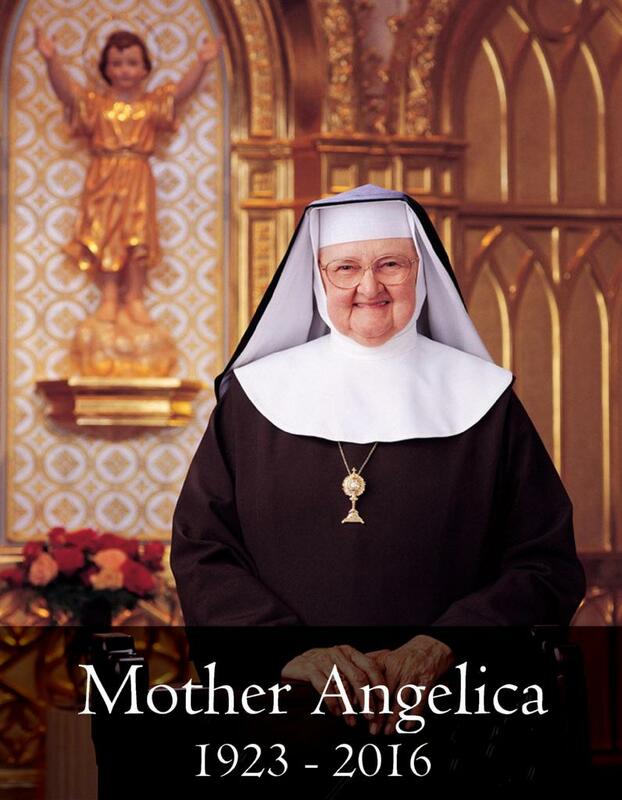 Mother Angelica was a well known Catholic figure and the founder of EWTN. Over the years on the air, Mother Angelica spoke against a myriad of liturgical abuses and liberal practices in the Mainstream Church; though never fully committing to the Traditional Mass exclusively, she was recognized as a supporter of it and a staunch conservative in the Church. As we remember the life of Mother Angelica and as her body lies in Hanceville, AL now, it is important to remember that we should pray for the repose of her soul. I have seen a large number of Catholics on Facebook pressing for her immediate canonization and even praying to her. If Mother Angelica was alive, I'm sure that she would be reminding us to pray for the souls of the deceased - including her own. We can never assume anyone is a saint unless they have been validly and infallibly canonized by the Supreme Pontiff. If Mother Angelica's soul is in purgatory to pay off any remaining debt she may owe to the Divine Justice, it is a grievous error for us not to help her pay off that debt. So please join me in praying for the repose of the soul of Mother Angelica - not praying for her immediate canonization. Remember, God does not waste our prayers. If her soul is in Heaven, our prayers are simply applied to the relief of a soul who is in Purgatory. Grant them eternal rest, Lord, and let perpetual light shine on them. You are praised, God, in Zion, and homage will be paid to You in Jerusalem. Hear my prayer, to You all flesh will come. 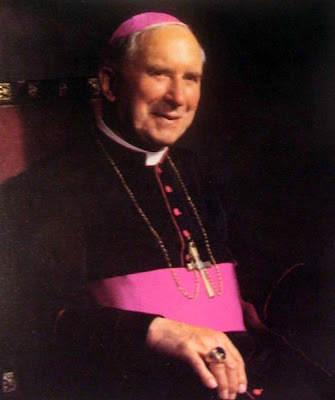 This past Friday was the 25th anniversary of the death of Archbishop Marcel Lefebvre. A Blessed Feast of our Lord's Resurrection to all of you! As Catholics, Easter for us is not only a Sunday holiday. The Feast of our Lord's Resurrection (i.e. Easter) takes place over the equivalent of 8 earthly days (i.e. it has its Octave). Each day of the Octave is the same as the first day in terms of the joy expressed in the Liturgy. So for that reason, the prayers in the Breviary for all of this Octave use the Psalms as prayed on Sundays.. 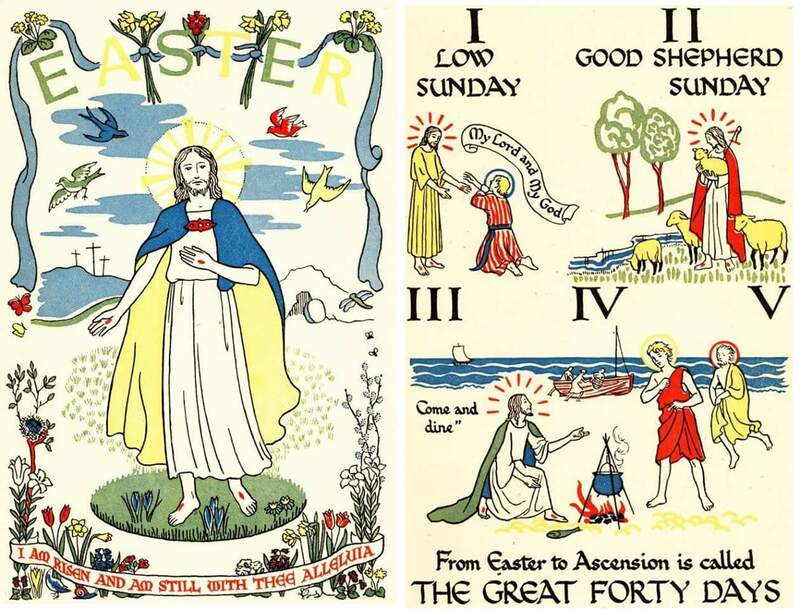 But after the Octave of Easter ends, the Easter season still remains. While Lent was observed by prayer, fasting, and abstinence for 40 days, we celebrate Easter a total of 50 days. In this way Holy Mother Church shows us the joy of Easter has eclipsed the time of penance of Lent. Let all of us who have fasted and prayed through Lent celebrate this great season of grace. The price is $25 each and includes shipping. "Papal Social Principles," Thom. Harte, CSsR, 190 pp., 1956, Bruce publ. "What Think You of Christ? ", Wm. Bonniwell, OP, 198 pp., 1958, Herder publ. "The Holy Trinity," Rev. J. P. Arendzen, 153 pp., 1937, Sheed & Ward publ. 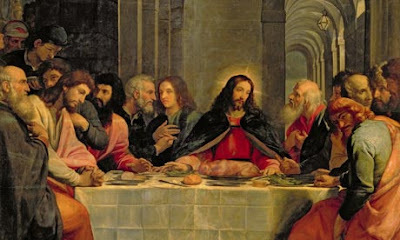 Holy Thursday celebrates especially the institution of the Mass at the Last Supper as the Sacrifice and Sacrament of Christian unity. On this day also, Jesus first shared His priesthood with men by ordaining the Apostles. Then He uttered the command that is the reason for every Mass: “Do this in remembrance of Me.” This is a day to think of the great love Jesus showed in instituting the Eucharist and to return that love by receiving Him in Holy Communion. Through Holy Communion we are united to Christ and to one another. By sacrificing His life to unite men to God, by feeding men on Hid own Flesh and Blood, by an example of mutual charity given in washing the Apostles’ feet, by the command to love one another and to wash one another’s feet, by praying that they be one like the Father and Himself, and by showing the actual unity of all of them in Himself as branches in a living vine--in all these ways Jesus taught and molded men into one. The Holy Thursday liturgy provides a ceremonial washing of feet. Wherever this is performed it is a living picture of Our Lord’s command that we love one another. Everyone should spend some time today in adoring Jesus at the altar of repose. The stripping of the Altars after Mass is a sign that Mass will not be offered again until Holy Saturday evening. 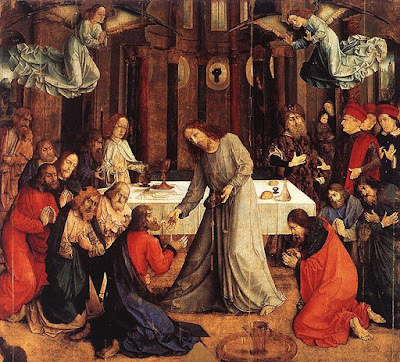 See my post on Holy Thursday for much more information. But it is fitting that we should glory in the cross of our Lord Jesus Christ, in whom is salvation, life and resurrection for us, by whom we are saved and delivered. Ps. 66:2. May God have mercy on us and bless us; may He let His face shine upon us; and may He have mercy on us. But it is fitting . . . The Gloria is sung. After the Gloria, the organ is not played, nor are the bells sounded, until the Mass of the Easter Vigil on Saturday night. COLLECT - O God, who punished Judas for his crime and rewarded the good thief for his penitence, be merciful to us! Our Lord Jesus Christ in His passion gave each one recompense according to his deserts; may He deliver us from our sins of old, and bestow on us the grace of His resurrection; who lives and rules with You . . . I Cor. 11:20-32Brethren: When you come therefore together into one place, it is not now to eat the Lord's supper. For every one taketh before his own supper to eat. And one indeed is hungry and another is drunk. What, have you no houses to eat and to drink in? Or despise ye the church of God and put them to shame that have not? What shall I say to you? Do I praise you? In this I praise you not. For I have received of the Lord that which also I delivered unto you, that the Lord Jesus, the same night in which he was betrayed, took bread, And giving thanks, broke and said: Take ye and eat: This is my body, which shall be delivered for you. This do for the commemoration of me. In like manner also the chalice, after he had supped, saying: This chalice is the new testament in my blood. This do ye, as often as you shall drink, for the commemoration of me. For as often as you shall eat this bread and drink the chalice, you shall shew the death of the Lord, until he come. Therefore, whosoever shall eat this bread, or drink the chalice of the Lord unworthily, shall be guilty of the body and of the blood of the Lord. But let a man prove himself: and so let him eat of that bread and drink of the chalice. For he that eateth and drinketh unworthily eateth and drinketh judgment to himself, not discerning the body of the Lord. Therefore are there many infirm and weak among you: and many sleep. But if we would judge ourselves, we should not be judged. But whilst we are judged, we are chastised by the Lord, that we be not condemned with this world. For us Christ became obedient to death, even to death on a cross. V. Therefore God also has exalted Him and has bestowed upon Him the name that is above every name. The right hand of the Lord has exercised power, the right hand of the Lord has lifted me up. I shall not die, but live, and shall declare the works of the Lord. SECRET - O Lord, Holy Father, Almighty and Eternal God, may our sacrifice be acceptable to You through our Lord Jesus Christ, Your Son, who on this day commanded His disciples to perform this rite in commemoration of Him; who lives and rules with You . . .
POST COMMUNION - We are nourished by the Bread of Life, O Lord our God. may this most sacred rite of our mortal life bestow upon us Your gift of immortality. Through Our Lord . . . The Canticle of the Passion is a Dominican tradition with a long history. The following passage recounts how after the first time St. Catherine experienced her mysterious ecstasy (which she did for a number of years on each Friday) that united her so closely to Jesus Crucified, Our Lady appeared to her and revealed to her what have come to be called the Verses of the Passion, a series of Scripture passages that refer to Our Lord’s sufferings. These verses are solemnly chanted in the Dominican Order every Friday during Lent : may they help you to foster in your soul this devotion so dear to our Order and so extremely important for the whole Church and the whole world. Père Hyacinthe Bayonne, O.P., Vie de Sainte Catherine de Ricci de Florence, religieuse du Tiers Ordre régulier de saint Dominique au monastère de Saint Vincent de Prato, en Toscane, (1522=1590), Paris, 1873, p. 163-167. The Blessed Virgin herself wished to consecrate all these testimonies of the authenticity of this grace by a singular favor which would henceforth serve to nourish the piety of the faithful. Immediately after the first ecstasy of the Passion, she appeared to Catherine in order to congratulate her on the perfect resemblance she now had to herself in the mystery of the Compassion at the foot of the cross of her Son. Content to meet, after sixteen centuries, a worthy imitator in this magnanimous path, she was pleased to encourage her with her sympathy and to increases the holy ardors of her love. She taught her to celebrate this mystery in a form that is fitting for the great emotions of the heart, in the form of a sacred canticle. This canticle, composed exclusively with words from Holy Scripture, she had no doubt composed originally for herself, after the death of her divine Son, as a sustenance for her dolor, a bouquet for her love, during the remainder of her life. And now that Catherine had taken her place at the foot of the cross, the divine Mary made it pass from her heart into the heart of the saint, so that she, in her turn, might make it the object of her meditations and the sustenance of her love. Who wouldn’t love to hear the Mother of dolors reciting the dolors of the Bridegroom to the new bride crucified with Him, and singing in her virginal voice the nuptial-song of the heroic wedding of Calvary ? 1. My friends and my neighbors, have drawn near and stood against me. 2. I was delivered up and came not forth, my eyes languished through poverty. 3. And my sweat became as drops of blood, trickling down upon the ground. 4. For many dogs have encompassed me, the council of the malignant hath besieged me. 5. I have given my body to the strikers; and my cheeks to them that plucked them. 6. I have not turned away my face from them that rebuked me, and spat upon me. 7. For I am ready for scourges, and my sorrow is continually before me. 8. The soldiers plaiting a crown of thorns, placed it upon my head. 9. They have pierced my hands and my feet, they have numbered all my bones. 10. And they gave gall for my food, and in my thirst they gave me vinegar to drink. 11. All they that saw me laughed me to scorn; they have spoken with their lips, and wagged their heads. 12. They have looked and stared upon me, they parted my garments amongst them, and upon my vesture they cast lots. 13. Into thy hands I commend my spirit; thou hast redeemed me, O God of truth. 14. Be mindful, O Lord, of Thy servants; when Thou shalt come into Thy kingdom. 15. Be mindful, O Lord, of Thy servants; when Thou shalt come into Thy kingdom. The second part is consecrated entirely to the reflections this great mystery inspires in the soul, always in the beautiful language of Scripture, which says so much in so few words. It is first of all a cry of gratitude for the mercies of the Lord that rings out even into eternity. It is followed by a regretful look back on all that we have cost our sweet liberator. Then, after a clamorous call of alarm to His goodness for us and an act of unlimited confidence in Him who called Himself our Savior, the canticle concludes with a humble prayer to Jesus Christ that the merits of His blood be applied to us. 16. The mercies of the Lord, I will sing for all eternity. 17. Surely He hath borne our infirmities, and carried our sorrows. 18. He was wounded for our iniquities; He was bruised for our sins. 19. All we like sheep have gone astray, every one hath turned aside into his own way. 20. For the Lord hath placed upon him the iniquities of us all. 21. Arise, why sleepest Thou, O Lord? arise, and cast us not off forever. 22. Behold, God is my Saviour, I will deal confidently, and will not fear. 23. We beseech Thee, O Lord, help Thy servants, whom thou hast redeemed with Thy precious blood. On transmitting this canticle to Catherine, the Blessed Virgin ordered her to propagate it in the monastery, as a form of contemplation and prayer sovereignly pleasing to her divine Son. (Her confessor) submitted it to the approval of the Order. The Master-General, who at that time was Father Francesco Romeo de Castiglione, did not just permit its usage in the monastery of Saint Vincent. By a circular letter to all the Provinces, he inscribed it among the devotional practices of the Order of Saint Dominic. It has become known as the Canticle of the Passion, as a monument to the piety of Saint Catherine de Ricci for her Jesus Crucified. It is still today the general custom in our churches to sing it publicly on certain occasions, and especially all the Fridays of Lent. It always produces a profound impression of piety in recollected souls. Thoughts On The Passion by Father Louis Bourdaloue, S.J. “And when He had said these things, one of the servants standing by gave Jesus a blow, saying: ‘Answerest Thou the High Priest so?’ (Jn. 18, 22). WHAT, pray, had Our Savior answered when questioned by the High Priest? What did He do to deserve such prompt chastisement? What was there in His reply to call for such an outrage? Annas had asked Him for an account of His teaching, and in reply Jesus had referred him to His disciples whose testimony should be sought on this point. Does this constitute an offence? Is this sufficient cause for insulting Him, for striking Him on the face? But we cannot argue here according to the laws of equity, they are all transgressed; we cannot expect justice in a trial where passion dominates, and that one of the most violent of passions—envy. The only object of our consideration, of our admiration, of our imitation, must be the imperturbable calm of the Son of God under circumstances which would upset any man no matter how strong, no matter how much master of himself. Long ago had the Lord said by the mouth of His Prophet: “I have not turned away my face from them that rebuked Me, and spit upon Me.” (Isaias 50, 6). It is in this way that He would teach us to receive injuries, a lesson which is of practical importance in daily life—to receive injuries as Jesus did, that is, to bear and even to welcome them: to bear them by accepting them patiently, and even to welcome them by accepting them with joy: far from breaking forth into anger or seeking revenge, to go so far as to expose ourselves to them and even to love them. What a test it must have been for Our Lord’s patience to receive a blow in the presence of a large assembly; to receive a blow as a punishment, as a correction; to receive a blow from a common servant. This is an unpardonable insult if offered to an ordinary man, but what an enormous crime it must be when we consider that it is offered, not to an ordinary man, but to the Son of God, to God-made-Man? Our Savior could have exacted terrible vengeance for this insult: He had only to say the word and fire would have come down from heaven to destroy the insolent aggressor: He had only to ask His Father for legions of angels to assist Him: He had but to make use of His own miraculous power in His defense. Not only had He the power to avenge Himself for the insult, but it would even seem to have been incumbent on Him to do so. For there is here a question of scandal. He is struck on the ground that he had shown disrespect to the High Priest. If He accepts it, He would seem to admit the charge of disrespect of authority; it would leave a stain on His character whose purity they had sought in vain to tarnish. Nevertheless, He would not exact the justice, because His action would be capable of being interpreted as springing from a spirit of resentment or a desire for revenge, and this is just what He desires to banish from men’s hearts, namely, all trace of that spirit of resentment and that desire for revenge. It is not as if vengeance does not belong to Him since He is God: “Revenge is Mine” (Rom. 12. 19). But if it belongs to Him as God, it does not belong to Him as man; and since He is man as well as God, and what He did as God might be attributed to Him as man, He would not avenge Himself, in order to teach men not to seek revenge, and in order not to provide them with even an apparent precedent to which to appeal. He had indeed worked a miracle in the garden, when, at His single word, the soldiers, sent to seize Him, had fallen backwards on the ground. But that was before they had attacked and laid hands on Him, when such a miracle could not be regarded as an act of revenge. But now that He has been outraged He does nothing. If He worked a new miracle His enemies would fear Him; but He prefers to appear helpless, rather than appear to act under the influence of passion, Therefore He answers, not haughtily, not insisting on His rights, but with unutterable gentleness: “If I have spoken evil, give testimony of the evil; but if well, why strikest thou Me?” (Jn. 18, 23). This is His only answer. He does not vindicate His rights: He does not punish the evil-doer with a punishment that would be an example for all time. For no matter how well-merited this chastisement might be, it could not but be taken for an act of revenge springing from natural resentment. Our divine Lord avoids even appearing to take vengeance, for He has come to destroy among men the spirit of revenge. And since in this matter the appearance and the reality are hardly distinguishable, in order to destroy the reality, which is sinful, the slightest appearance must be avoided. As the giver of the New Law, He had already given His commandment, and had taught forgiveness of injuries to His disciples; but, St. John Chrysostom says, that was not enough. He must safeguard this precept and put it outside the reach of all the stratagems and subtleties to which men descend, when under the influence of passion, in order to avoid its obligation and practice. For, the holy Doctor adds, how inventive we become when our self-love is aroused: we persuade ourselves that we are insulted when the injury is only imaginary; or if we have indeed received some slight injury, we magnify it out of all proportion. In order to justify ourselves, we put on a mask of righteousness, of zeal for the laws of equity: we draw up arguments and call in authorities to prove that we are doing only what is reasonable, what is expected of us, and seek a thousand and one reasons for justifying our action. It was necessary to put an end to all this; and in order to achieve this purpose, man could be left no room for argument; because there is nothing so subtle and so full of guile as the reasoning of a mind under the influence of passion, for then it is really the heart that reasons. So our Divine Savior had to strengthen this precept by putting it outside reason; and this He did by His example—by example in allowing this outrage to go unpunished, with even demanding reparation. For even if He did not wish to punish this insult offered so publicly, even if He did not wish to make use of His divine power by which He could overwhelm evil-doers and make them feel the severity of His chastisements, could He not appeal to the judge, could He not appeal to His own outraged innocence and to the High Priest’s dignity which was injured by this act of violence committed before his tribunal, before his very eyes? Instead, He renounces all His rights, He forgets all His interests, He sacrifices all His glory, and is concerned only in giving us an example of the most heroic patience. This is an example so striking that it leases us no room for hedging. Now you will have difficulty in arguing, in justifying your action. After this example of our divine Savior you can only remain silent and give in. There is now no other rule to be followed, no other principle on which to act. It is a principle that is clear-cut and compromising; we cannot escape from it, inasmuch as it is so well within our powers of grasping. It is according to this principle that we must judge all others. It is the only principle that can repress the outbursts of a heart carried away by passion, be it ever so little Christian in outlook. In a word, from this principle there follows this great counsel put by our Divine Savior among the most important articles of that heavenly doctrine He came to teach us: “But I say to you not to resist evil, but if one strike thee on thy right cheek, turn to him also the other.” (Mt. 5, 39). Indeed, it is impossible not to relish this teaching of our divine Savior, bitter though it may seem, when we see Him putting it into practice Himself. We cannot say that He demands too much of us in wishing us to follow His example. Should we not regulate our lives according to His? Does He not wish to reform the world as much by His example as by His preaching? It was for this very reason that He became like unto us, that He assumed our human nature, that we might become like unto Him, that we might follow His example. It is just this example of God bearing patiently a most grievous insult that is the greatest condemnation of our countless susceptibilities and extreme sensitiveness in all that concerns the false honor of the world, of our impatience and irritation so difficult to moderate or satisfy. This is a vice that is very prevalent in our time, and is always on the increase. This is a vice which preachers of the Gospel with all their zeal and eloquence have not been able to correct. This is the last of all the vices of which we strive to rid ourselves, of which we believe we ought to rid ourselves. There are good people in the world who lead a fairly orderly life: their lives are characterized by nothing underhand, by no vicious habits or scandalous excesses; they are rather the soul of uprightness and honor in all things. 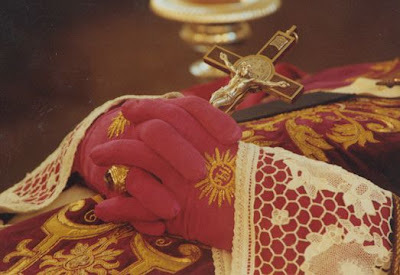 There are pious and devout souls who give themselves to pious practices, who visit churches, listen to the word of God, practice mental prayer, frequent the sacraments, and exercise charity towards the poor. There are religious souls who go yet further: with a view to arriving at the most sublime perfection, they give up all this world’s goods, renounce pleasures of sense, shut themselves up in a cloister, and there pass their days in poverty and obscurity, in a state of subjection and dependence, in works of penance and mortification. All these things are due to the Grace of God, and for them we cannot thank Him too much. But,—can I venture to say it? among all these good Christians, among all those souls who are virtuous, or who at least strive after virtue, among all these souls who are perfect, or who at least wish to be perfect, and for that reason have retired from the world, among all these there is perhaps hardly a single one who can overlook an insult, who can forgive and forget. We learn all other things, we train ourselves in all other accomplishments, we practice all other virtues; we discipline ourselves to fasting, to watching, to prayer; we learn to chastise the flesh and to mortify it. However, we hardly learned silence, patience, charity, moderation, self-control (especially when we believe ourselves to be offended). We hardly want to learn these things. We make a point not to be so good, not to be so forbearing; we do not want to pass for a person who can be attacked with impunity, who cannot defend himself. We would rather pride ourselves on the fact that we have rendered ourselves invulnerable—that we have taught others to respect us, not to take liberties with us. For all this we have a thousand and one reasons of prudence, of dignity, of justice: but reasons that, when examined and sifted, reduce to this sole reason—we do not want to suffer. Nevertheless, we claim to live in accordance with the highest standards of morality, we spend long hours before the Tabernacle; we belong to a circle that sets itself up as a model of virtue; we experience raptures and ecstasies: of a truth, we are like those mountains mentioned in Scripture, which a single touch causes to emit thick clouds of smoke and blazing names: “Touch the mountains, and they shall smoke” (Ps. 143, 5). Such mountains are those souls so pure and holy, or at least that pass for such. They are high mountains, mountains that reach almost to the third heaven by the sublimity of their views and aspirations. But just cross them even in the slightest way; just let slip one word, one gesture of disparagement; just contradict them in any way, ah! then they become volcanoes in eruption, belching forth smoke and fiery lava: or if, perchance, they restrain themselves and show no signs of annoyance, it is only to nourish a secret grudge, which, like a hidden poison, acts slowly indeed, but only to produce its effects the more surely and the more malignantly at the opportune moment. This is a fatal obstacle to the virtue of so many souls that are otherwise irreproachable. It is an obstacle that can cause their ruin, from which they can never escape because it follows them everywhere; and besides, it is often in the most regular communities that it is most to be feared. Whatever be your position in life, the example of Jesus Christ is meant for you. For the words of the Prophet addressed to Almighty God can easily he applied to you, you can say to yourself: “Look on the face of Thy Christ” (Ps. 83, 10). Have you been offended by word or deed? Have you difficulty in holding yourself in check and putting up with the offence? There are many considerations which would help to control your anger and to sweeten the bitterness of your heart, but the most potent of all is to look upon the face of your Christ. See this face before which the angels prostrate themselves in adoration, this adorable face struck by a servant? Look on the face of Thy Christ—your Christ, because He was anointed for you. You’re Christ, because He has delivered Himself into the hands of His enemies for you. You’re Christ, because He was immolated on Calvary for you. Your Christ—He is more than that, He is your God. Now compare person with person, insult with insult—the sacred person of the God-Man, and your miserable little self; a blow on the face, and an offence, perhaps in itself altogether insignificant, which you nevertheless make such a fuss about. It is a stain on your honor, do you say? Is your honor more precious than that of the Son of God? It is against your interests? Is your interest more important than that of our holy religion which is attacked in the person of its head and author? You have been insulted or your person, your name, your rank, your birth, has been disregarded? Is the insult offered to you greater than the insult offered to the sovereign majesty of God? No matter what you say, the answer is always the same: Look on the face of Thy Christ. Look on your Christ and learn of Him, not only to accept injuries patiently, but even joyfully, and, if needs be, to expose yourself to them, to love them. This is the point to be treated next. It is not enough for the example of the Son of God to extinguish in our hearts all desire for revenge. It should result in something more. It should make us ready to receive insult and contempt and any attack on our honor, about which we are so very sensitive. What does this mean? Does it mean that we must be ready to accept generously any aspersions on our honor? No, that is too little to expect. Does it mean accepting it all willingly as coming from the hand of God? Even this is not enough. Does it mean that we must welcome it, love it, glory in it and seek after it? Yes, that is what we must strive after, and this, I venture to say, is something essential and often indispensable. Perfection, it would seem, cannot be raised to a higher degree; and yet this perfection, which appears to be so elevated, becomes, on many occasions in our daily lives, a precept which obliges us strictly in conscience. Let us develop this important point and make it as clear as possible. For instance, what means must I take if I am to forgive injuries generously, as I ought, and not to desire revenge? What must I do if I am to be prepared on every occasion to uphold the cause of God, and to defend it; to oppose scandals which I see arising at every instant in the world about me, scandals which, in virtue of my office, it is my duty to suppress as far as I can; to disregard all those considerations which might deter me when the honor of religion and its interests are at stake? In a word, what must I do if I am to have an unshakeable resolution to behave as a Christian, and not bring dishonor on this glorious name, regardless of the cost, regardless of what may be said about me? In all these eases, and in countless others, what contradiction, what false judgments, what sharp words, reproaches, and calumnious talk, and even insults must be faced? How can we undergo all these evils with resolute firmness unless we are ready to love them for God’s sake, to welcome them for God’s sake, to honor them and even to glory in them for God’s sake? The faith which we profess demands of us the same sentiments which the Apostles expressed when they were calumniated and ill-treated by the Sanhedrin. They considered themselves happy to suffer all kinds of opprobrium for the name of Jesus Christ. “They were rejoicing that they were accounted worthy to suffer reproach for the name of Jesus.” (Acts 5, 41). It is quite true, and beyond any possible doubt, that this requires great purity and generosity of heart; but it is a necessary virtue. And if our holy religion imposes on us a law that is so difficult and contrary to the tendencies of our nature, it also gives us the aids we need to practice it, and of these is there any more potent and more capable of consoling and strengthening us in the humiliations of this life than the contemplation of Our Divine Savior, God-made-Man receiving a blow on the face, and not merely receiving it, but even desiring and seeking it? Be quite sure of this, He received it only because He willed to receive it, for He could have prevented it. But not only did He not wish to prevent it, He desired it, He exposed Himself to it: He made it the object of His most ardent desires and, as it were, the object of His delight. The Prophet Jeremias, when speaking of the sufferings of Our Divine Savior, used an expression which is very apt and very forceful, namely, that He would be sated with opprobrium: “Saturabitur opprobriis.” We do not partake of a dish which is distasteful to us; or if we must, only the bare minimum. But if it is a dish we like, we eat of it with relish, even with avidity; we eat our fill of it, even to satiety. Our divine Master made humiliation His food. He took His fill of it. If the Son of God made humiliation His food and the object of His desires, in order to procure the Glory of His Father and the salvation of men, should it not become for us an object of respect, of veneration, even of love, especially since by it the same Glory of God and the salvation of men are obtained? It is for this reason that David, though he was King, seeing this mystery of God being violently outraged, instead of fleeing from insults, awaited them, asked for them, and received them with thanks as if he received favors. “My heart hath expected reproach.” (Ps. 68, 21). Semei, one of his subjects, poured out maledictions and reproaches upon him, but the King blessed God for them. His whole court, righteously indignant, wished to punish the audacity and presumption of the insolent fellow, but the King forbade them. “Let him be,” he said, “God has sent me this humiliation: it is a gift from God. Do not take it away from me.” Who could have inspired David with a sentiment so unusual in a King, and even so much opposed to all principles of policy? It could be nothing else than the consideration of His God and Savior, undergoing the ignominious sufferings of His Passion, revealed to him in vision. He saw the God of all glory, the sovereign majesty, insulted by a blow on the face, and filled with a holy indignation at this spectacle, he cried out: “Ah, Lord, who fear after this all the outrages in the world; who would not long for them, since You take them for yourself and make them ornaments of Your Sacred Humanity? Therefore, My Lord, I accept them, no longer simply as a proof of my patience, for I have no longer any need of this virtue, but as the fulfillment of the desires of my soul which waits for them and longs for them. My heart hath expected reproaches.” Note well the reason he gives, for it contains a short formula for the whole of the gospel teaching: “For the reproaches of them that reproached Thee are fallen upon me.” (Ps. 68, 10). Because, My God, all the outrages heaped upon You in Your dolorous Passion, have fallen in anticipation on me: because, having considered them carefully and in thinking upon them, I have had most lively experience of them myself: because they have filled my heart with a supernatural desire, with a supernatural love of them, with a love of them not in You, Lord, but in myself. For even though I am attacked personally and these outrages are offered to me, I regard them as Yours, and considering them in that light, how can I not love them? Yes, Lord, they are Yours, since You have made them pass from Yourself to me, and after first experiencing them You have made them fall back on me. “Because the reproaches of them that attacked Thee, have fallen upon me.” (Cf. St. Augustine: Commentary on Ps. 60). Only the Grace of God can establish a soul in this disposition and this is not surprising, for only by the Grace of God can we do homage to the humiliations of the God-Man. Flesh and blood cannot teach us these grand maxims or those exalted moral principles; only the Father Who is in heaven can reveal them to us, only the Son Who came down on earth, only the Holy Ghost Who abides in our soul. And this work is, as it were, the masterpiece of God’s all-powerful Grace. But let us be fully convinced of this fundamental truth, that without it we cannot be Christian at all. This is what Scripture teaches, and this is what we must take to heart. For this is a point that must be insisted on, a point that we cannot meditate on too much: that it is impossible to be a Christian, even a simple Christian, if we are not prepared for insults of all kinds; for there are countless occasions in our lives on which we are bound, under pain of damnation, to expose ourselves to humiliations in order to satisfy our conscience and for the salvation of our soul. Furthermore, it is impossible to be really prepared for humiliations as long as we retain a voluntary aversion for them; and finally, we must inevitably have the same horror of them, unless we have a just estimation for them and love them for God’s sake. These propositions follow necessarily one from the other, because we cannot love what we do not value, and we must value what we consider wretched and contemptible. We must therefore begin with the intellect in order to form in our hearts those real tendencies which God requires of us. In proportion as we learn to value insults and outrages, as the world calls them, we shall reverence and welcome them. But how can we value and love what lowers us in the eyes of men, what humiliates us and takes away from us our honor? As long as we regard them in themselves, and do not look beyond them, we cannot value them; but we must not consider them in themselves, we must view them in Jesus Christ, in relation to Jesus Christ. That is, we must look upon them as a portion of the reproaches offered to Our Lord, as making us like Our Lord; as something to offer to Our Lord, as an opportunity of showing our love for Him. When viewed in this light there is nothing so humiliating, nothing so degrading in the eyes of the world, which does not become glorious to the eye of Faith, which we do not embrace as a benefit, as a favor. This lesson is so much beyond ordinary human views, that it is impossible to make it too clear, and to point out exactly what is expected of us in practice. Such expressions as to esteem insults, to love insults and rejoice in them, to receive insults willingly and even with pleasure, are so strange and so much above our feeble nature, that we wonder what it all means. It does not mean that we must stifle all feelings of repugnance. It does not mean that we most become so entirely callous that we do not experience those movements of self – love or displeasure which are really inseparable from our human nature. It does not mean that we must feel pleasure in them or that they should appeal to our sensitive nature. It is true that some saints have reached the stage where they had so far repressed their lower nature that no insult or outrage could disturb in any way their peace of soul; they sought them as eagerly as ambitious men seek vain distinctions and worldly honors. Numerous examples can be given, but they are all extraordinary graces, miracles of Christian humility which are in no way indispensable to the practice of this virtue. It means that in spite of what worldly prudence tells us, in spite of even the most violent revolt of our sensitive nature, we consider ourselves happy to share the ignominy of the Son of God, especially when it is for the Glory of God or in defense of the Faith. It means that we must prefer to be despised, to be ridiculed, to be condemned and even persecuted for justice’ sake, rather than by compromising, to be applauded and praised and honored. It means that we must have an inviolable resolution never to deviate from the path of virtue, whether in the hope of worldly distinction or through disgust for a hidden and a lowly condition. Sometimes we may be greatly agitated, we may be moved to the very depths of our being, we may be tempted to burst out in reproaches and angry recriminations. At critical moments we may feel helpless, unable to bear any more. But amid this storm of our senses from which our reason and our will stand aloof, we remain immovably fixed in our adherence to the same principles, which are the principles of the Gospel. We hold firmly that it is a good, the greatest good in this life, to be able to prove our fidelity to God when we feel most desperate. We find strength in Our Lord’s words to the Apostles: “They will accuse you, they will calumniate you, they will speak all kind of evil against you. But do not you relax in the exercise of your ministry, do not worry. On the contrary, you ought to glorify it, and rejoice. Be glad and rejoice.” (Mt. 5;12). We are sustained by these consoling thoughts: that the greatest glory of a Christian is to make to God the sacrifice of his own glory; that if it is the most difficult sacrifice, it is also the most meritorious of eternal life; that a humiliation received in such a good cause is a deposit which receives hundredfold profit; that there is no better way of showing Him our inviolable devotedness; that if at first it is bitter to the taste, this bitterness soon changes into a sweetness that is real and sometimes even overflows into the senses, if we use the eye of Faith in judging an insult which is offered to us. All such considerations give the soul, not the blind prudence of this world, but a truly divine wisdom; they strengthen it; they restore its calm, and give it peace in the midst of circumstances which give rise to so many disturbances and wars among men. May it please God to animate you with this spirit. If He does not raise you to the point of rejoicing in insult, He will at least strengthen you against one failing which is very common among Christians—namely, human respect, which is an obstacle to so many good works, and is the cause of many disorders and evils. Because we are afraid of ridicule or mockery we often neglect most important obligations and even allow ourselves to be led on to excesses and crimes which are abhorrent to us; because we have not the strength to overcome a false sense of shame, how often do we experience its disastrous results. If we wish to free ourselves from this slavery, let us follow the advice of the Apostle, and keep before our minds the example of Our Blessed Lord: “Looking on Jesus, the Author and Finisher of Faith.” (Heb. 12, 2). He is its Author by His wisdom and its Finisher by His love: He is its Author by His all-holy doctrine, and its Finisher by His divine example. He did not wish to be the Author of our Faith without also perfecting it; not only lest we should think that it was quite easy for Him to order things thus without having to observe them Himself, but above all because its perfection seemed to Him as glorious and as worthy of Him as its authorship. While wishing us to be faithful observers of His Law, He reserved to Himself the glory of being the perfect model of its observance, the Finisher of our Faith. St. Paul tells in very explicit terms how He did this: “Who having joy set before Him, endured the cross, despising the shame.” (Heb. 12, 2). It was by despising the shame, by rising above it and bearing it with courage and constancy. But I venture to add something to these words of the great Apostle without altering their meaning; it was not only by despising the shame but by loving it. Hence I can never hope to have a really strong faith nor a truly solid piety, as long as I am dominated by human respect, by the fear of not being the subject of conversation, by the fear that man will turn against me, that they will attack me. But as soon as I am freed from this slavery, as soon as I am no longer ashamed of my God and of my duty, then I begin to be a Christian. Going, if necessary along the way of humiliation, which is so contrary to the false ideas of this world, I shall arrive at that true glory, which is the eternal glory. The story of these mysterious martyrs unfolds in the city of Sebaste during the reign of Emperor Licinius in 320 A.D. A garrison of Roman soldiers-- 40 in number -- were stationed in this remote Armenian town. 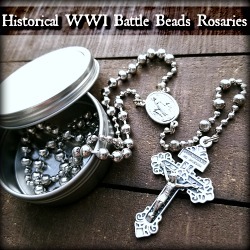 While they were bold, courageous soldiers, they were also devout Christians. 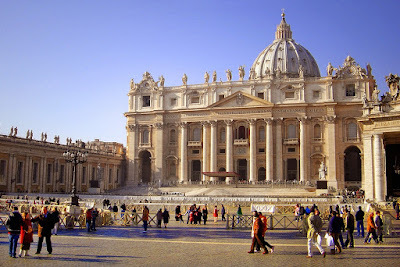 Upon hearing of this in Rome, the infuriated Emperor issued an edict, stating that those throughout the Empire who would not worship pagan gods would be tortured and put to death. An additional contingent of soldiers was sent to Sebaste to see exactly where the loyalties of these 40 Christians actually stood. We are told that to a man, all forty soldiers refused to reject Christ. A cruel death was planned for them. It was bitterly cold in Sebaste at this time of the year, and they were forced to remove their clothes and stand along the shores of a frozen lake, looking across the waters at the glowing fires of the pagans -- where they could go if they would renounce the Lord. Still they refused! As death approached, a band of angels came down from heaven and placed crowns on the heads of these dying saints. 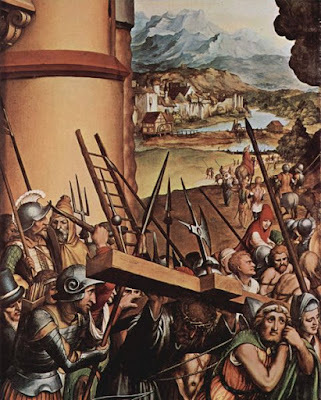 It is said that one of the Roman guards was so moved by this glorious sight that he removed his own garments and rushed to die himself at the side of these Christian warriors. Though we are not all called to the trial of martyrdom, we are all bound daily to fight, and to conquer too. By multiplied victories which we gain over our passions and spiritual enemies, by the exercise of meekness, patience, humility, purity, and all other virtues, we shall render our triumph complete, and attain to the crown of bliss. But are we not confounded at our sloth in our spiritual warfare when we look on the conflicts of the martyrs? "The eloquence of the greatest orators, and the wisdom of the philosophers were struck dumb: the very tyrants and judges stood amazed and were not able to find words to express their admiration, when they beheld the faith, the cheerfulness and constancy of the holy martyrs in their sufferings. Happy shall he be whom these works shall attend. He shall then be the companion of the martyrs, and shall appear with the same confidence before Christ and his angels. 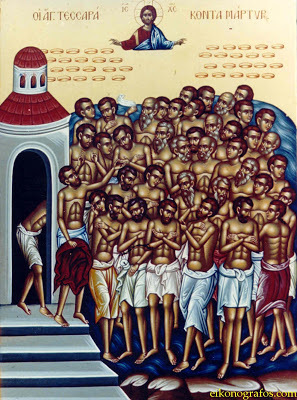 We beseech you, O most holy martyrs, who cheerfully suffered torments and death for his love, and are now more familiarly united to him, that you intercede with God for us slothful and wretched sinners, that he bestow on us the grace of Christ, by which we may be enlightened and enabled to love him." 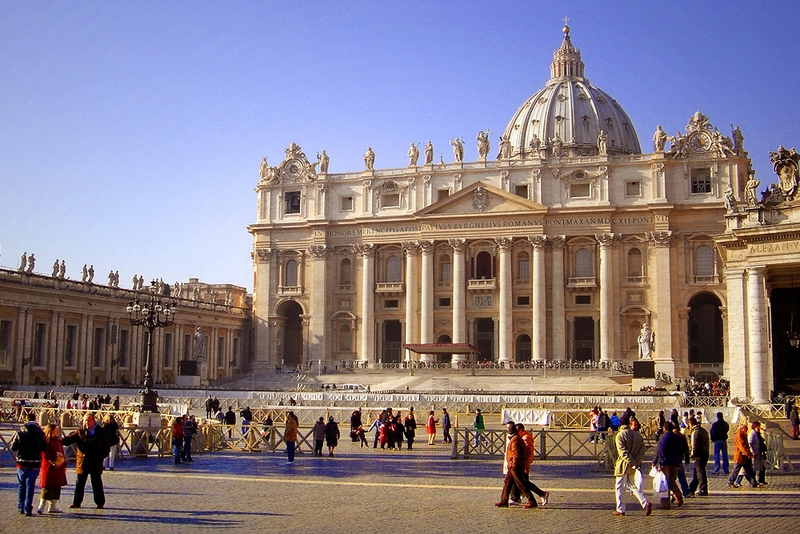 I am pleased to announce that I will be participating in one of my life long goals: spending Holy Week in Rome. All in all, this will be an even more significant trip for me since this a Jubilee Year and the Holy Doors will be open. As a result, I ask for all of you to please post below any prayer intentions that you have. I will bring these with me and offer these in prayer while visiting all of the 4 Major Basilicas and the other churches in the Eternal City. While it is subject to change, my tentative schedule is as follows. Please do feel free to make any recommendations. While I may not be able to blog each day as I visit these Christian marvels, I will share all photos within a short time of my return. And your intentions will be in my prayers. I ask for your prayers for a safe trip and one of worthy preparation in order to celebrate the great Feast of the Resurrection on Easter. 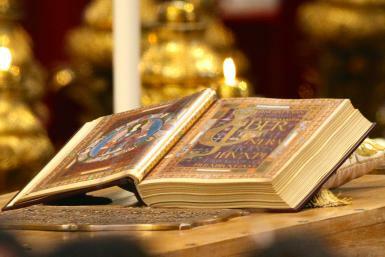 The monks of the order of St. Benedict have long required spiritual reading by all of their members during Lent. Spiritual reading helps us turn to the Lord and become deeper in our prayer life. In the words of St. Thomas Aquinas, "Union with God consists in knowing God perfectly. For the better one is known, the more perfectly one is loved." Back in 2007 I wrote the short post Book Recommendations for Lent and I would encourage you to look at the video on that post. But it's important to note that you do not have to spend money to read a good book for Lent. If you are reading this post now, Lent is nearly half over. But fear not! There is still plenty of time to read a truly uplifting and spiritual enriching book this Lent. 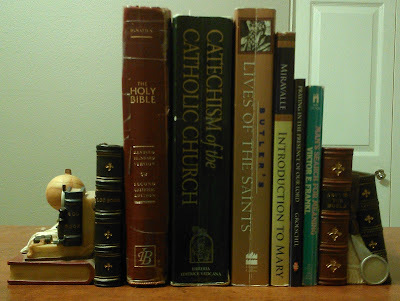 Catholic Treasury: Many long-time spiritual classics all available freely online for reading. 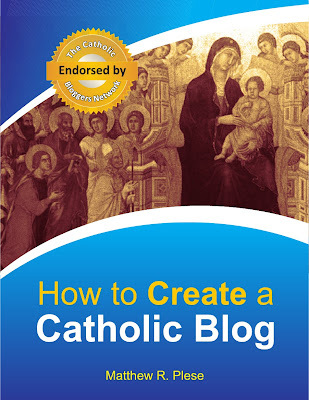 Free Traditional Catholic Books: Some wonderful and truly Catholic books to read. All free. You don't need to pick a long book. This is not a challenge. 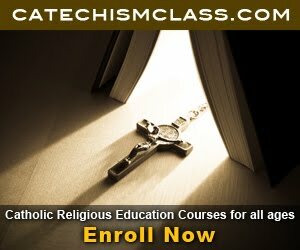 It's a chance to to grow intellectually while also participating in Lenten prayer, fasting, and almsgiving. Pick a book and read it through from now til Easter. And see the spiritual fruit in your life. As for me, to hold me accountable, I will say that I am reading Sister Saint-Pierre and the Work of Reparation and if anyone is interested, it is an easy read and very enriching.